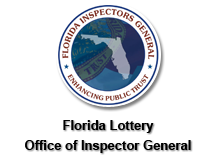 The investigative function of the Florida Lottery Office of Inspector General is accredited by the Commission for Florida Law Enforcement Accreditation, Inc. The investigative process is designed to detect and deter fraud, waste, mismanagement, misconduct, and other abuses within the Lottery. Consistent and fact-based reporting to the Lottery Secretary. Administrative investigations are conducted by the OIG when there is reason to believe that a Lottery employee, vendor, contractor, or contractor's employee has violated any Lottery rules, policies, or procedures. State employees, contractors, and contractor employees who submit a complaint relating to a substantial and specific danger to the public's health, safety, or welfare or a complaint relating to gross mismanagement, malfeasance, misfeasance, gross waste of public funds, or gross neglect of duty may be a designated "Whistle-blower," as defined by Section 112.3187-112.31895, Florida Statutes. Whistle-blower investigations are conducted under the strict guidelines of the Whistle-blower's Act. Specifically, if the complaint is determined by the Inspector General to meet the provisions of Whistle-blower status, the identity of the complainant remains confidential and the Whistle-blower is protected from retaliation.